Do you eat brussel sprouts? I used to think they were gross, but that was because I have only tried them steamed before. I roast them drizzled with olive oil, crushed garlic and salt/pepper. Just a little note: Serve them right away! Reheated, they just don't taste the same. Here is how I make them. I usually pick up brussel sprouts at Trader Joe's, its one of those things that I never put on my list, but if see them, I get some. Trim the Brussel sprout off the stalk. Cut off the bottom and peel off any leaves that fall off. I usually cut my brussel sprouts in half. Take a large bag ziplock bag and put them in there. Add about 1/4 cup of olive oil, salt, pepper, crushed garlic and paprika and give everything a good mix. 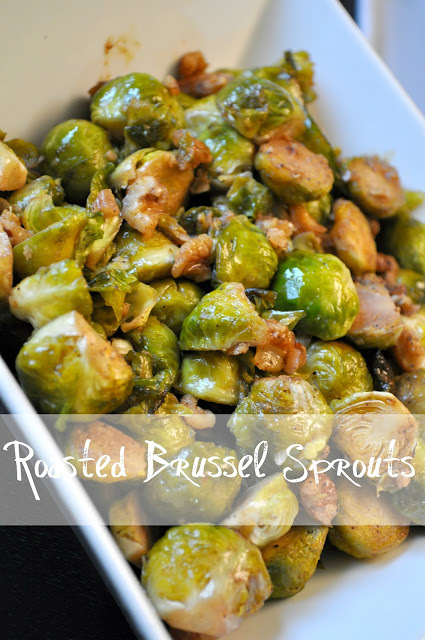 You can keep the sprouts in the zip lock bag in the fridge until you are ready to to roast them. Sometime I add nuts. Pine nuts, walnuts... whatever I have in the pantry. This time it was walnuts. Preheat oven to 350 and roast for about 30 minutes, stirring often. thanks for the recipe!! My husband was raving about how delicious they were at your table, and I agree! !